Giving Back to the Community – September 2017 Wrap Up! 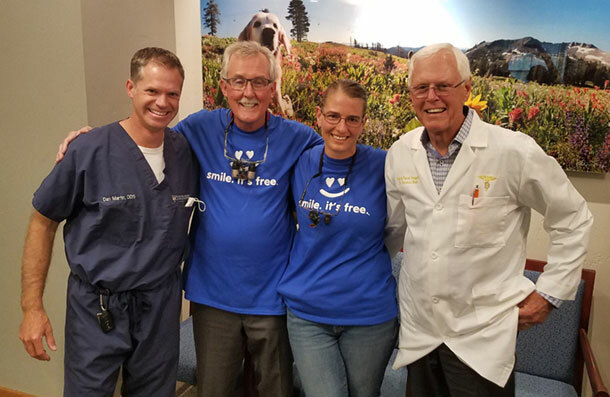 Dr. Dan Martin and team during the 2017 Dentistry From the Heart event – just one of the ways our team at Tahoe Oral Surgery and Implant Center gives back to the community. Dentistry from the Heart 2017 started off much busier than the last few years of this event. But, our Tahoe Oral Surgery Team was prepared and ready to provide oral surgery treatment to our Dentistry from the Heart patients from throughout the Truckee/Tahoe region. For a total of $14,617.00 in treatment provided free of charge to our community members most in need of oral surgery care. A big thank you goes out to Dr. Terry Rust for his help and Sierra Crest Dental for again hosting this event for our community and inviting us to be a part. California Careforce is a group of medical professionals, community leaders and general volunteers who provide free medical, dental and vision care to those in need at mobile health clinics across California. This September, Dr. Rachel Appleblatt volunteered along with several other professionals to make the California CareForce event another success. This year’s clinic hours saw over 1500 patients and donated over $750,000 worth of services to Sacramento community members in need.